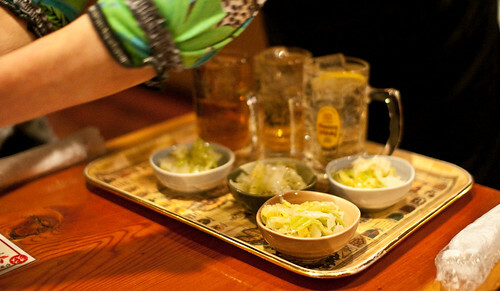 A 15 minute taxi ride from Utsunomiya station, way up in windy Tochigi is your standard izakaya. Utsunomiya is the big city in Tochigi prefecture, and I'll try and write about how lame it is soon. It was so lame, in fact, that a friend of mine actually told me to stop with the sarcastic comments that came naturally ever couple of minutes, because that type of American humor isn't funny. Burn! 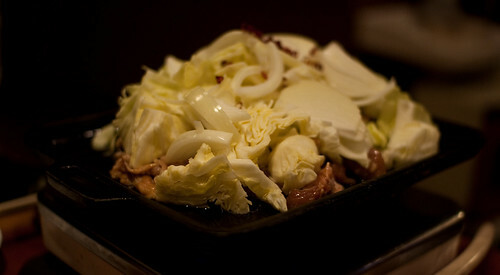 Back to Kayabuki izakaya. The food was good. 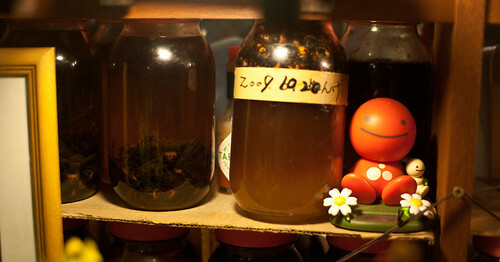 And for 6000 yen you can buy a bottle of Japanese booze infused with deadly suzume bashi wasps. Could this place get any cooler? 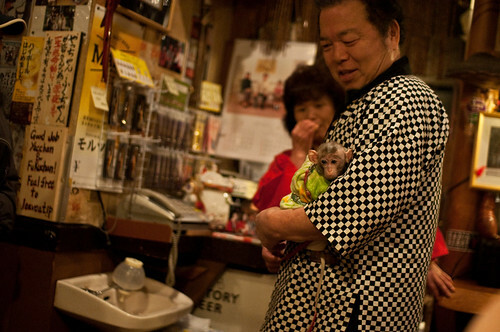 The owners, a perfectly normal couple of old Japanese folk, have 3 pet monkeys that have been trained to work. The work is just the monkey bringing you a towel, but then he'll totally jump up and hang out on your head while you eat. You heard me right! There's not much more to say. By now, you are sold on this place, no? 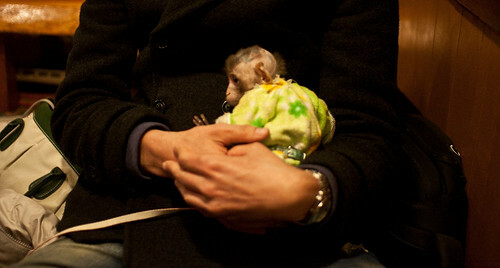 Oh wait, there's also a baby monkey. You heard right! 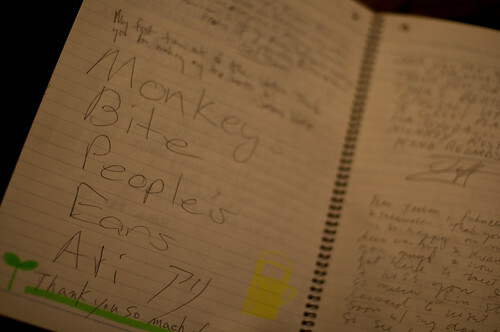 The radness of a grown monkey doing funny monkey things and the cuteness of a little snuggly baby monkey. 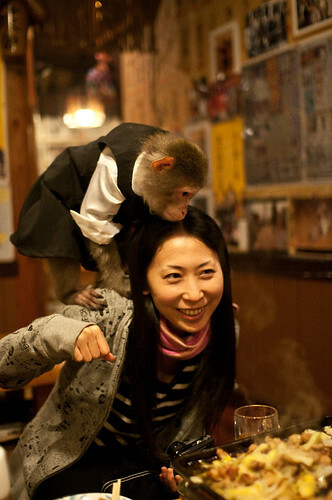 Monkey bite ears!... and other antics. 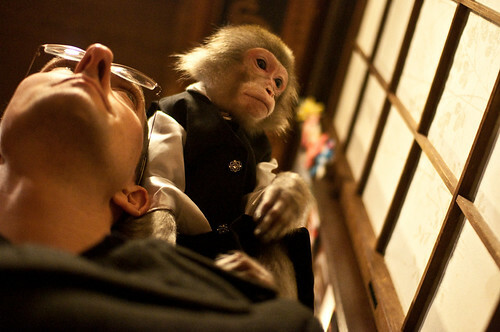 At one point the owner went out of the room for about 10 seconds, and monkey totally grabbed a handful of our food. Then when the owner walked back in he quietly dropped the snack without being noticed. Later, he was chilling on my friend's head, and I tapped him on the leg, trying to get his attention (the monkey's attention). Monkey didn't like being touched, and he straight slapped my buddy. Like 5 fingers full palm full power slap. I played like I didn't know why monkey would do such a thing. Sorry Paul, my bad. 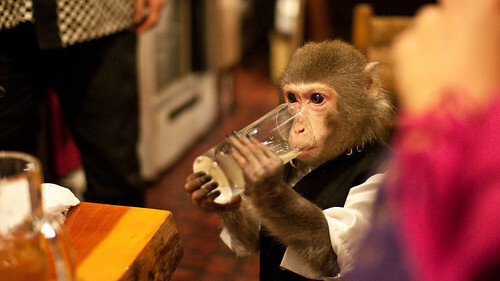 Monkey jacked a green onion when the owner wasn't looking. So awesome. Monkey bit my friend's arm. So... be careful I guess. A couple drinks and some food was way cheap too. Thank you Utsunomiya for making my dreams come true! 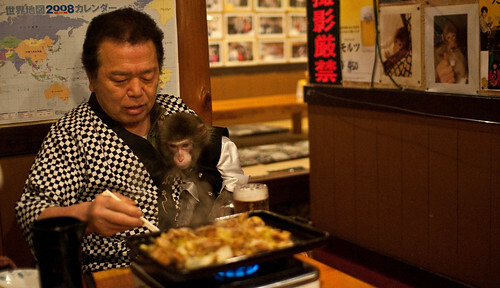 Any restaurant that has a monkey has me sold! LOL.... that's sooo funny. Talk about spanking the monkey... hold on, it was the other way around! Just as long as they're toilet trained (and they don't try and go for the beer)! I think that this treatment of any primate is absolutely disgusting and have no respect for people that think this is "cool" the monkeys probably get really badly treated after their work to ensure they are kept working. perhaps you should take your heads out of the clouds and sign the petition for the laws of primates kept for entertainment purposes changed. Sorry, Anon, but this place was very cool. 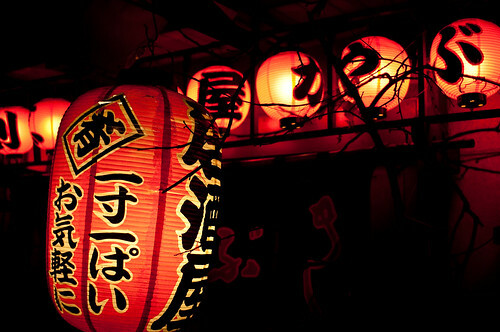 Hello, my name is Esra Krabbe and I am working for a magazine in Japan. 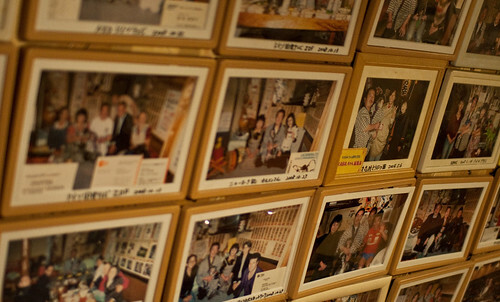 We were wondering if we could us the photos of Kayabuki in this blog for our magazine (we have already received OK from the restaurant).